Home / Blog / Feeling the HEAT … Tips for keeping you hydrated! The HEAT is ON! So keep hydrated! Now that summer is in full swing and the heat wave is set to continue through the UK this week, it is even more important to keep your fluid levels up! Water makes up between 50-70% of our body weight. Proper hydration is vital for your body’s performance, as well as your daily heath. Your skin looks better, you have more energy and generally feel better. Every cell and tissue of your body requires water to run at peak efficiency. For an athlete or fitness fanatic, this is especially important. Dehydration is a sign that your body, organs, cells and tissues need more water to function properly, so its serious stuff! 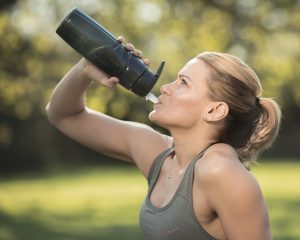 When the temperatures are soaring we lose more fluid when we sweat, so it’s even more important to stay hydrated and drink plenty of fluids during the summer months. Exercise can also lead to dehydration as we sweat more when exercising and lose electrolytes used to keep the body functioning. Make sure you keep drinking before, during and after exercise. Ideally 600ml around 45 mins before exercise should get you fully hydrated. Try to avoid exercise in the heat of the day if you can. Early morning or evening is best or even an air-conditioned gym in extreme heat. If you are racing or training hard, make sure you keep taking on fluid regularly in the days before, don’t just drink excessively before the event as your body wont have time to get fluid around your body. How much you need will vary on a number of factors, including the climate, how active you are, and whether you have any health problems. The recommended amount for the average person is 2 litres per day. However for someone that is very active the recommendation is 1ml water for every kcal burned. Using this calculation a runner that burns 2500 Kcal should take on 2.5 litres of fluid or a cyclist that burns 6000 Kcal would need 6 litres. You can estimate your water loss when you exercise by weighing yourself before and after exercise. The weight lost will allow you to easily calculate how much fluid has been used. One litre of fluid weighs one kilogram. * Be sure to replace fluid lost gradually with a drink containing electrolytes for lost salt during exercise. Water – Plain water (tap or filtered) is best, you get hydrated without excess calories and it helps to flush toxins through the body and cleanse your system. Tea and coffee – Limit your caffeine and go for herbal if you can. Both are diuretics so increase loss of fluid from the body. The tannins in tea can reduce the body’s ability to absorb iron from food, so best to avoid tea with a meal. Soft drinks – Try to avoid squashes and fizzy drinks. They are generally loaded with sugar that will cause a spike in blood sugar and contribute to tooth decay and empty calories. Fruit juices – Fruit juices can provide vitamins if you go for natural juice rather than the concentrate that can be high in added sugars. They are still high in natural sugars so avoid large quantities or dilute with water. Sports drinks and energy drinks – These are often loaded with caffeine and sugar. They can be great for high energy and may be a source of electrolytes but not good for the teeth and extra calories if you are not burning them off. So now you know the importance of keeping hydrated, here are some top tips to help you keep your fluid levels up this summer! Keep a bottle with you throughout the day that can be easily refilled from the tap when needed. Invest in a stainless bottle that is insulated to keep drinks cool. Buying bottled water can be expensive as well as creating plastic waste! Liven up tap water by adding some fruits such as lemon, strawberries or cucumber to give a bit of flavour. Always drink water before, during and after exercise. Feel hungry? Drink water. Thirst can often be confused with hunger so drinking plenty of water to help cravings and manage weight. Don’t wait until you are thirsty before you drink. Set a reminder to ensure you keep your fluid levels up! Now enjoy the heat wave while it lasts!